I used to think my appliquéd circles were pretty good. Then I tried out a product by Karen Kay Buckley called “Perfect Circles” (about $12 retail) and discovered how much better they could be. 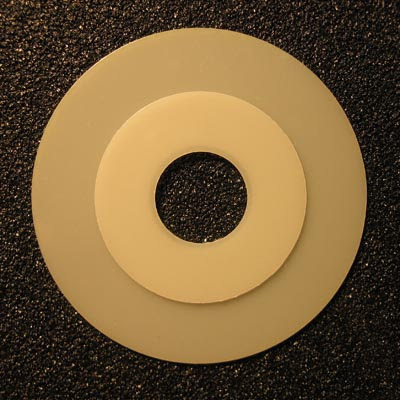 The product consists of a bunch of heat-resistant plastic circles of different sizes (four of each size) and a metal ring on which to store them. The first step is to find the circle the right size you need. Simply place the circles on top of your pattern until you find the right size. 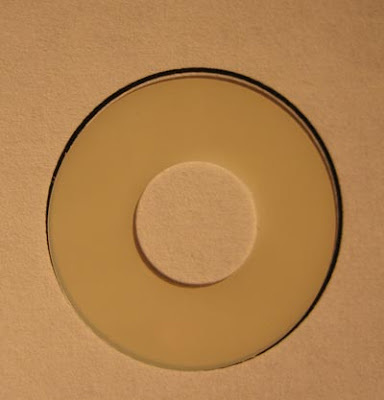 Next, find a circle that is about 1/2 inch wider than the finished circle size you need (so you have 1/4 inch more all the way around). 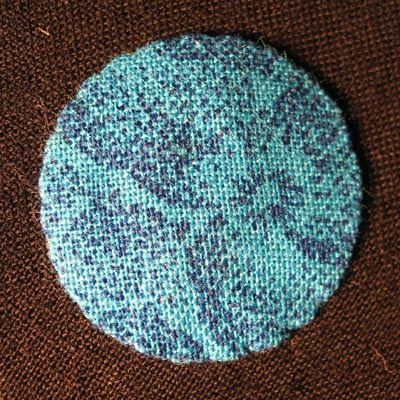 Take this larger circle and place it on top of your fabric, and trace around it. I love using a quilter's sandpaper board (see photo above) for this step, since it holds the fabric in place while you trace around the circle. I have tried a million different kinds of quilting markers. The ones I like best are shown in the photo below. All are mechanical pencils. The colored ones are by Clover, and are available at many quilt shops and online. They come with a set of leads, and you can buy refills once they run out. They are a bit on the soft side, and tend to snap easily, but if used with a gentle touch, they leave nice dark lines that are easy to see. And the lines are very thin, which is important for accuracy. 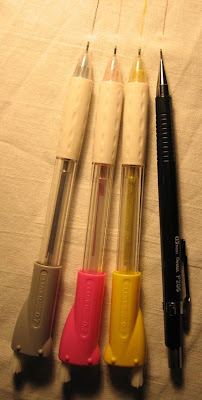 The yellow and pink ones are marvelous for marking dark fabrics. The one on the far right is a regular mechanical pencil with a 2B 0.5mm lead refill. 2B is the softest lead you can buy for mechanical pencils. It is hard enough that it doesn't snap, but it leaves a very dark, crisp fine line. You can buy the leads at office supply stores next to the mechanical pencils. If you don't use the 2B leads, you'll be frustrated with a regular mechanical pencil; the leads are too hard and they snag in the fabric and don't leave dark enough lines. Now cut out your circles on the line. 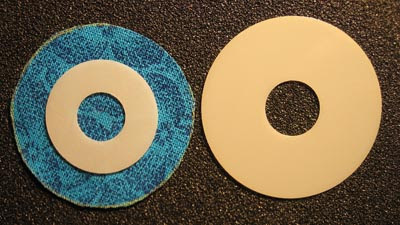 Here is a photo of the circle I used to trace (on the right) and the fabric circle with the plastic circle (the right size you need to applique) on top of it. 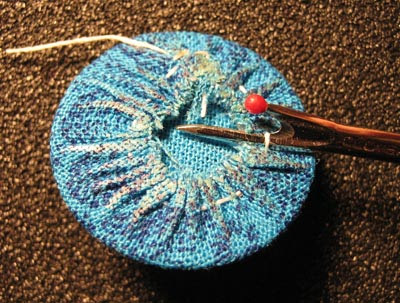 Take a fine needle and strong cotton thread (I use hand quilting thread). Thread your needle and knot the end. 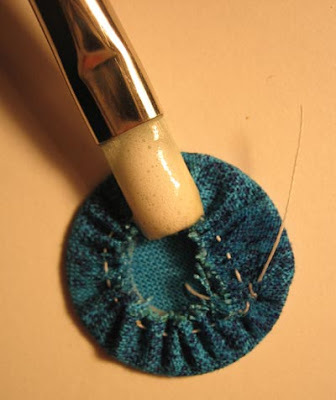 With the fabric right side up, sew a running stitch about 1/8 inch from the edge. 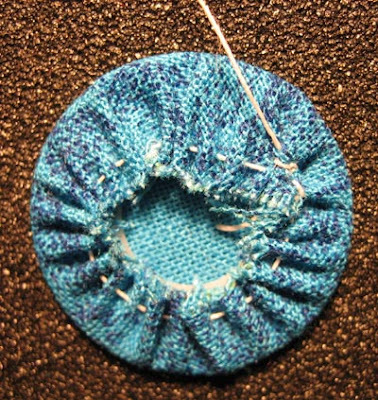 Note: with the bigger circles, you can actually machine stitch with the largest basting stitch, around the edge. 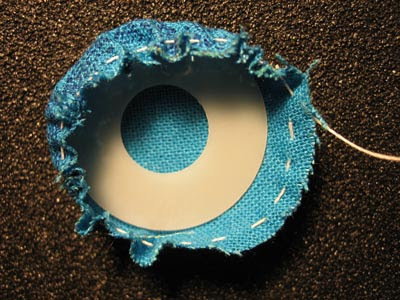 Place the fabric circle right side down, and place the plastic circle in the center of it. Pull on the thread, until the fabric pulls up around it. It should be very snug. I usually take a few stitches through the little pleats to secure it before the next steps. 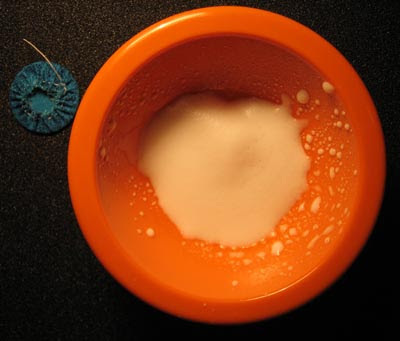 Spray some Magic Sizing or spray starch into a small bowl. It is very foamy at first, but will eventually turn back into a liquid. NOTE: I do have some concern about Spray Starch, as I fear it might attract moths or silverfish, which can eat holes in fabric. Magic Sizing works just as well but does not contain starch. 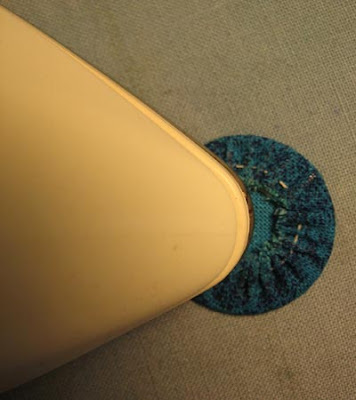 Using a clean brush, brush the pleated surface with the Magic Sizing until it is wet. 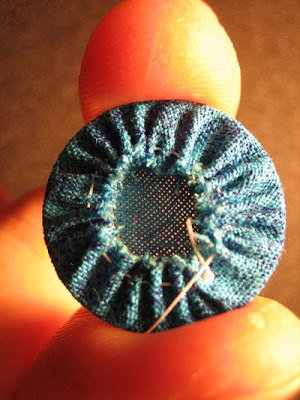 Make sure the thread is pulling the fabric up tautly, into a perfect circle, and then iron it until it is dry. Use a medium high heat; if you are too hot, the plastic WILL melt. It is heat resistant, not heat-proof, I discovered! 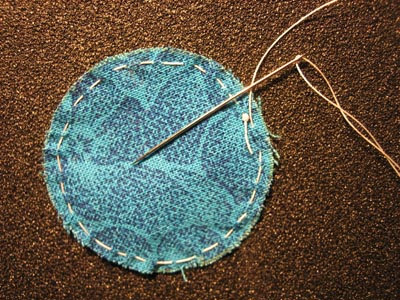 When the circle is completely dry, use a seam ripper to cut some of the threads, just enough that you can get the plastic circle out. Pin the circle down and appliqué it. Voila! A perfect circle. I have been using Perfect Circles for my Bohemian Bouquet designs (see post below) and have been very pleased with the results. Take a look and let me know what you think! Karen also has “Bigger Perfect Circles” with even larger sizes. Thank you for sharing this tutorial! I've tried it this way but never with the great templates. Great tutorial. You may want to try using sizing instead of starch. From what I've learned in classes taken with Beth Ann Williams, it doesn't attract silver fish and other nasties. I have some of that starch alternative here, so I'll give it a try. 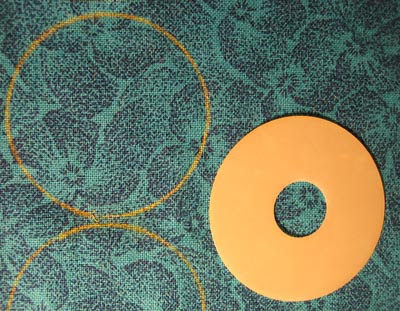 Looks like a great way to really "nail" the perfect circle. Hi Susan I've got to get some of those circles. The next quilt I plan to make I've called the lollipop tree and there are lots and lots of circles. I didn't know how I would get them perfectly round, but now I know. Thanks for sharing that. 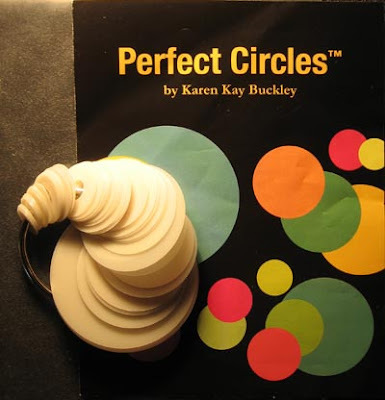 I was introduced to Perfect Circles when I took some classes with Karen Buckley in 2006. They continue to be my favorite tool for quilting. BTW, she has now come out with a larger size of Perfect Circles, they're on my Christmas wishlist! Can you see these circles onto your quilt with your sewing machine or do you have to hand sew them? I hand sewed mine, but I think you could sew them on by machine, too.